But sadly it degenerates and fragments like a motherfokker. After one and a half year it's at 20% of the speed it started at. And there's no known way of defragmenting it, except copying all the files from-and-to the filesystem again. is really ext3 2 times slower on SSD? how can this be? is this the efect of lack of garbage collection or not trimming? I'm pretty sure that ext3 is winning very big on the SQLite benchmark because it does a large number of random writes to the same blocks --- and since ext3 has barriers off by default, on the hard drive the disk collapses the writes together and most of the writes don't actually hit the disk platter. Good luck to your data if you have a power hit, but that's why ext3 wins really big on an HDD. On an SSD, at least OCZ, it's not merging the writes, and so the random writes result in flash write blocks getting written, so that's why ext3 appears to be much worse on the OCZ SSD. Other SSD's might be able to do a better job of merging writes to the same block, if they have a larger write buffer. This would be very SSD-specific. I suspect that JFS didn't run into this problem, even though it also doesn't use barriers, because its write patterns happened to fit within the OCZ's write cache, so it was able to collapse the writes. Personally I don't think it really matters, since running a database like SQLite which is trying to provide ACID properties without barriers enabled is obviously going to (a) result in a failure of the ACID guarantees, and (b) result in very confusing and misleading benchmark results. Michael, for the graphs could you put a larger separator between the HDD and the SSD? I see there's a little hash mark, and the colors repeat. But at first glance it was kind of hard to tell where one ends, and the other begins. I wouldn't want a benchmark for your particular scenario because I'll never enter a situation like that, and I would venture that a majority of users would not either; any such data would skew opinions of file systems unnecessarily. I don't care how well a Corolla tows a 3 ton camper, just tell me how well it drives in basic conditions (city, highway) and I'll go from there. Where are the overall performance charts? I've been asking for these sort of charts since pts was in beta. These sort of articles are useful for individual metrics but are useless for the average reader who is just trying to choose the best overall. They aren't shown in Phoronix articles as it would detract in page views... If you want averages, you can go to the respective page on OpenBenchmarking.org, and opt to view the averages, see the overall table, calculate geometric / harmonic / aggregate sums, etc etc. 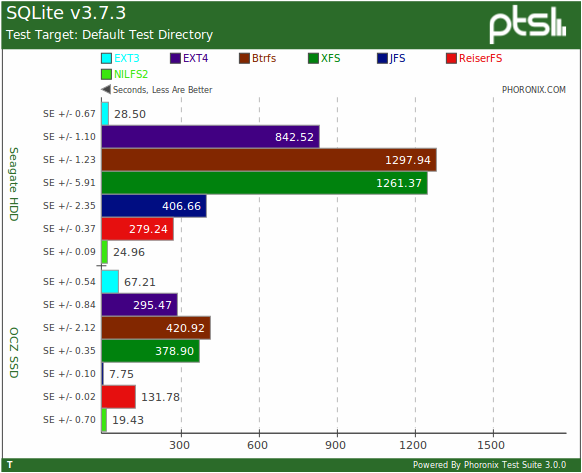 If you take the time to tabulate and average out relative performance, you will see that NILFS2 was the best overall for a HDD, but reading this article won't tell you that. Is this so much to ask from pts? No benchmark, no matter how thorough, is going to cover every scenario and every possible usage of a file system. If you are in a position such as you are where you have a very narrow set of requirements and usage scenarios for a file system, shouldn't you be running your own benchmarks and not relying on this set? No offense, but your situation doesn't apply to me and it never will. I wouldn't want a benchmark for your particular scenario because I'll never enter a situation like that, and I would venture that a majority of users would not either; any such data would skew opinions of file systems unnecessarily. I don't care how well a Corolla tows a 3 ton camper, just tell me how well it drives in basic conditions (city, highway) and I'll go from there.